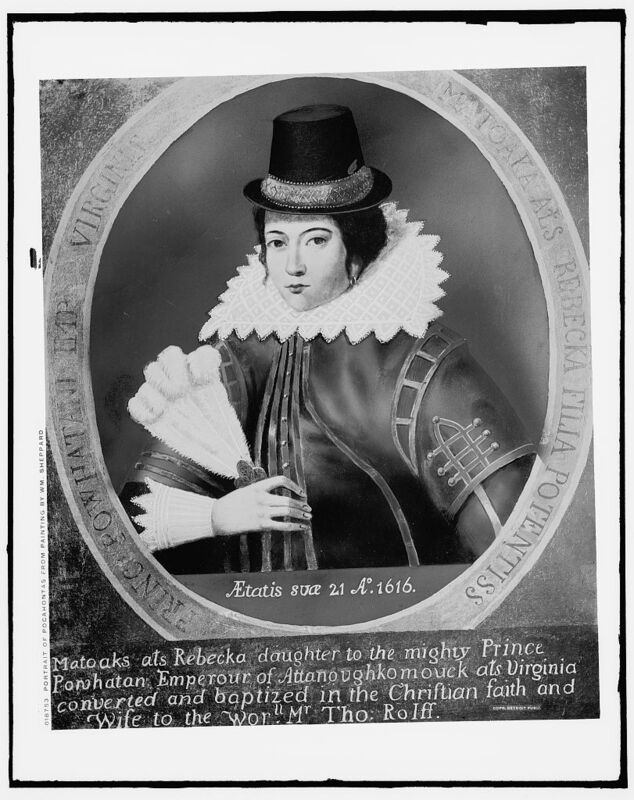 Pocahontas (c. 1595 – 1617) was born Matoaka, daughter of Chief Powhatan, the paramount chief of Tsenacommacah, in Virginia. Pocahontas is famous for saving the life of Captain John Smith – at one time an apprentice in King’s Lynn – who helped establish the first permanent English speaking settlement at Jamestown, Virginia. However, it is likely that Smith was involved in a scripted ceremony in which he was symbolically ‘killed’ and then reborn as a member of the tribe. During the first Anglo-Powhatan war, Pocahontas was captured by the English and held for ransom. During her year in captivity, she converted to Christianity, taking the name Rebecca. She also met John Rolfe, who she married in 1614 – a ceremony officiated by Reverend Richard Bucke – and bore him a son, Thomas, who was born in 1615. The family travelled to England, where Pocahontas was entertained at various high society gatherings. They spent time at Rolfe’s family home in Heacham. In 1617, Rolfe and Pocahontas boarded a ship back to Virginia, but Pocahontas became seriously ill, and died in Gravesend, Kent, where she is buried. Although Rolfe returned to America, Thomas was raised by his uncle at Heacham Hall. Thomas returned to Virginia as an adult. He married Jane Poythress, who bore him a daughter, also called Jane. Today, many Americans claim descedancy from Pocahontas through Thomas, Jane, and her son, John Bolling.